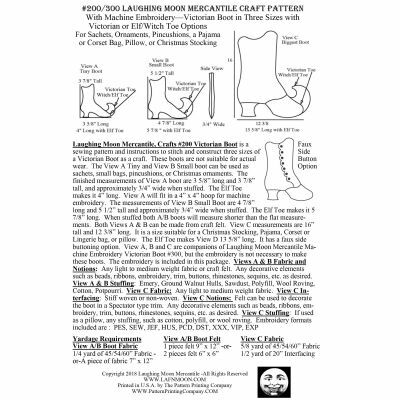 Sewing pattern and instructions to stitch and construct four sizes of a Victorian Boot as a craft. These boots are not suitable for actual wear. View C can stand on its own; the others cannot. The View A is Tiny and View B Small boot can be used as sachets, small bags, pincushions, or Christmas ornaments. 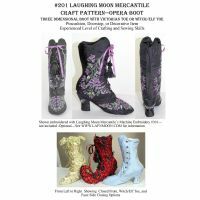 The finished measurements of View A boot are 3 5/8” long and 3 7/8” tall, and approximately ¾” wide when stuffed. The Elf Toe makes it 4” long. View A will fit in a 4” x 4” hoop for machine embroidery. The measurements of View B Small Boot are 4 7/8” long and 5 ½” tall and approximately ¾” wide when stuffed. The Elf Toe makes it 5 7/8” long. 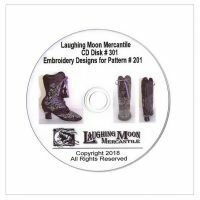 This boot will fit in a 5” x 7” hoop for embroidery. When stuffed both A/B boots will measure shorter than the flat measurements. Both Views A & B can be made from craft felt. Views A, B and D are easy to make. View C is a medium size, 3-dimensional replica of a Victorian boot that could be used as a pincushion, doorstop, or decorative object. It has a faux side buttoning option. 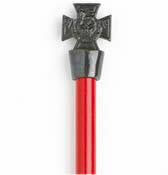 The dimensions of View C are 7 ½” long, 9 ¼” tall, and 2 5/8” wide at the widest point. The Elf Toe makes it 9” long. The individual pattern pieces of View C will fit in a 5” x 7” hoop for embroidery. View C requires intermediate sewing and crafting skills. View D measurements are 16” tall and 12 3/8” long. 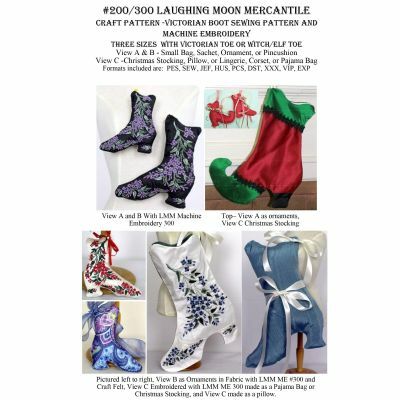 It is a size suitable for a Christmas Stocking, Pajama, Corset or Lingerie bag, or pillow. The Elf Toe makes View D 13 5/8” long. It has a faux side buttoning option. 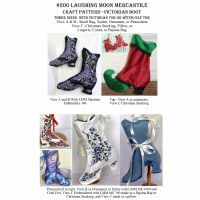 View A, B and C are companions of Laughing Moon Mercantile Machine Embroidery Victorian Boot, but the embroidery is not necessary to make these boots. Views A & B Fabric and Notions: Any light to medium weight fabric or craft felt. Any decorative elements such as beads, ribbons, embroidery, trim, buttons, rhinestones, sequins, etc. as desired. 1. View A embroiders a small boot which can fit in a 4” x 4” hoop. There are four colors. The first color to come up is for the majority of the leaves in the leaves and flower design. The second color is also for leaves, and either the same or a complimentary color to the first should be used. The third color is for the flowers. The fourth color stitches out the stitching line for the tiny boot therefore a matching thread to the fabric would be a good choice. The finished boot is approximately 3 7/8” tall and 3 5/8” wide. 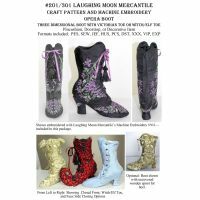 The design will stitch out the right side of a boot. You can flip or mirror the image in your machine to make the left side. 2. View B embroiders a small boot which can fit in a 5” x 7” hoop. There are four colors, exactly like View A, and will make the right side. The finished boot is approximately 5” tall and 4 7/8” wide. It will stich out exactly like View A. You can flip the image to make the left side. 3. View C Heel Right - This is the embroidery for the right heel for the pattern 200. It has two colors, the leaves and the flowers. You can flip it in your machine to make the left side. 4. View C Toe Right - This is the embroidery for the right toe of the pattern 200. This pattern has three colors, the two shades for the leaves and one for the flowers. 5. View C Top Right - This is the embroidery for the right side of the top of the boot. It has three colors: The first color is for the majority of the leaves, the second is a complementary color for the leaves, and the last is the flowers.